Freak Out: Extreme Freeride Game Review - Download and Play Free Version! Hit the Alpine Slopes & Perform Stylish Jumps and Stunts at Breakneck Speed! Grab Your Skis and Shred! Take to the alpine slopes as you perform stylish jumps and stunts at breakneck speed! Explore the open environments of four mountain landscapes and take part in special missions to score points or start a racing career. Upgrade your skier with more than 30 pieces of equipment and see if you can conquer the various spectacular jumps. There are tons of racing and jumping missions on each mountain as well as Special Events where you can gain extra points and special prizes. Also, grab some friends and play with up to eight players simultaneously in multiplayer mode. With the freedom to choose your own path down the mountain side, you can choose whatever challenges you want to face and select your favorites. Fans of the snowboarding game SSX will find themselves right at home with this game but with skis instead. Complete a variety of challenges scattered across the mountains ranging from rail, jump, gap and pickups. Simply ski into one of the floating icons to start one of these challenges and start grinding a path, scoring big air points and collecting stars in order to unlock mountains and make some cash. There are also a variety of level missions, such as scoring 100,000 points, collecting 5 dogs, or performing a double back flip that you must complete to advance. With your choice of six skiers, each with their own skills and tricks, as well as an assortment of equipment upgrades, you can tailor your skiing adventure to your very own play style. With easy controls and a simple interface, even those new to gaming can quickly pick up this title and start enjoying the fresh powder. Get your adrenaline pumping as you jump from sheer cliff faces and race across many dangerous avalanche-prone slopes. Listen to a whole library of original tracks as you fly down the mountain and complete enough level goals to unlock more landscapes and develop your racing career. If you like skiing games with some creative gameplay mechanics, then download Freak Out: Extreme Freeride today! 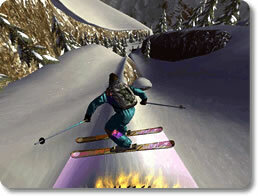 Freak Out: Extreme Freeride is a game that will have you skiing down snowy mountains and performing incredible tricks. You'll also be able to perform missions and meet other objectives to rack up points and unlock new mountains and gear. 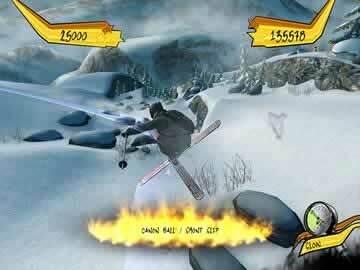 Amazing graphics and exciting music make this one heck of a skiing game. You start your game by selecting a skier and a mountain. You then start your ski run at the top of the mountain. On the way down, you'll come across items that will start a mission. The missions are fairly simple and are done as you move down the mountain. For example, one item might start a mission that requires you to pick up five items. Another mission may require you to earn a certain score on your next jump. There are also other objectives to complete, such as earning a certain amount of points or finding all of the hidden dogs on a mountain. There are four different mountains to choose from for your ski runs. While it would have been a good addition to add a few more, the levels included are realistic and expansive. Rocks, trees, jumps, and drops give you a host of obstacles to avoid and ways to rack up points with tricks. The great levels that are in the game make you wish that a few more were added. There are a few modes in the game to add a bit of variety. A Ski Now mode lets you choose a mountain and start skiing. The Career mode lets you play through the mountains on your skier and improve his standing. There's also a multiplayer option that lets you ski with others either via split screen or a network. Your progress in these modes can unlock new clothing and gear to use. However, you still can't change the other features of your skier. Freak Out: Extreme Freeride can be quite challenging at times, whether you're trying to complete a mission or land big tricks. Unfortunately, the game doesn't provide a difficulty option to adjust the challenge. A difficulty option is always a nice inclusion, although for this type of game it would be harder to implement. The controls for the game are fairly simple and easy to use. If you have the tutorial mode on, you'll get hints on what the controls are and when to use them. The one downside is that the simple and limited number of controls means that there's only a few trick types to perform. You can add some spins or flips to the tricks, but they don't change a whole lot. One of the best parts of Freak Out: Extreme Freeride is the presentation. The graphics are excellent and very detailed. You even see a trail in the snow behind you as you ski down the mountains. The music is another great addition to the game. Music from real bands play during your runs, and it fits perfectly with the game. The presentation really draws you into the game and gives the feeling of skiing. 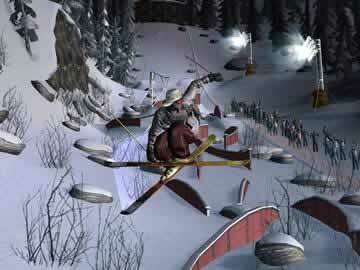 Freak Out: Extreme Freeride is a fun and thrilling skiing simulation game. It's an excellent choice for anyone interested in skiing and looking for a game to match their interest. You won't be simply skiing down the mountains, but performing a variety of tricks and jumps along the way. There are also missions and objectives to take on and improve your score. The mountains themselves are very large, realistic, and detailed as well. The presentation adds the perfect touch to a good game. Check out some of the sick tricks in Freak Out: Extreme Freeride!